An Android phone is full of charming. You can do many thing on your android phone. We are going to desribe an useful method that will help you to capture the game play at higher resolution in your Android device. Most of our people love game on their android phone. The games of android is very attractive to all us. Many game lovers love to record the gameplay that they play on their devices and for that users go for screen recording tools but their result doesn’t meet the expectation as the screen recording apps record screen at low-quality recording. Are you want to record your games when you are playing it. It your answer is yes then you are at the right place. Here you will able to find out how to record gameplay on android. We will show you the easiest way that you can do that easily on your phone. Here we have mentioned the best ways that are actually designed to records games in Android device and that too with a better quality. So have a look at the complete method discussed below to proceed. Google Play Games is the very common name to all of us who love android mobile games on their phone. This is the only way to play and save your level about your online games on your phone. At First you need to have the latest version of the app Google Play Games . If you still don’t have the update version of the app then hurry up. You can update the by going to google play store. You have to update the app because of Google Play provides this feature is only there in its latest version. After that you will see the new option Gameplay record that you will see in the saved feeds there in Google Play app. Now choose a game that you want to record the gameplay and there click on the Record logo. After that will be asked to choose the quality of your video recording. You can simply set the video quality you want. Now this is the final step. Simply launch your game and you will see the recording tray during the gameplay. This is the best way to record gameplay on android. Through this way you no need to install extra apps on your android device. 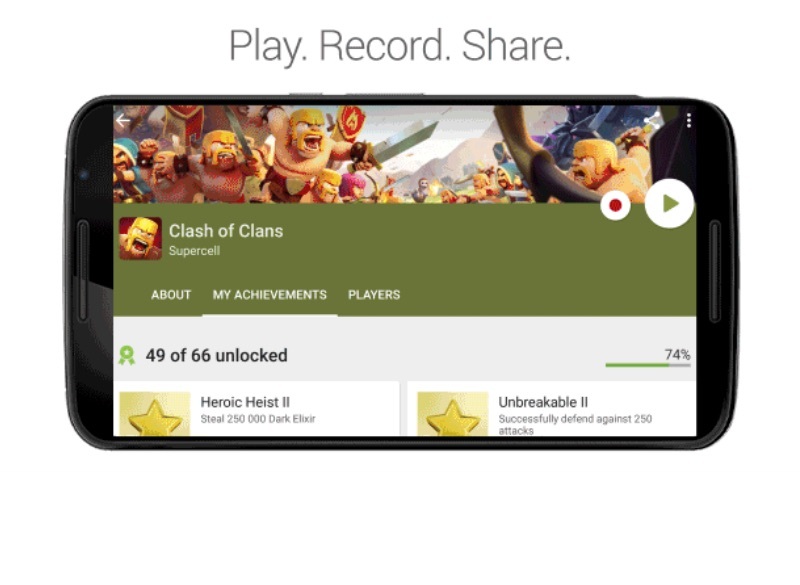 You can easily record your game when you are play it by the latest version of google play games. But remember one thing that only the latest version of google play games provide you this feature. Hope you like it. Stay with us and share the trick to your friends and family.